Let’s say it all together: Summer taco party. Your friends are over, the beer is flowing and everyone’s hungry. And, like it or not, they’re expecting something good. They’re probably expecting steak tacos. 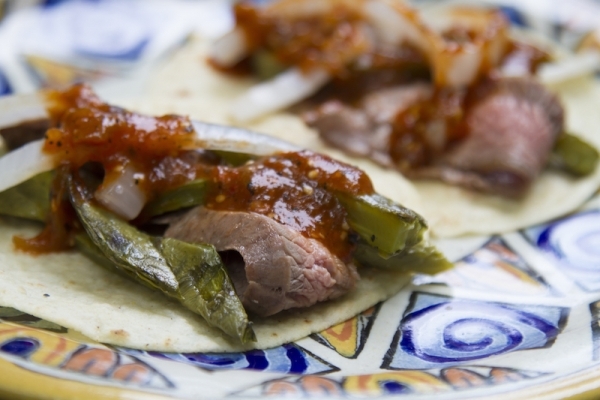 So … what kind of steak tacos are you going to make? You have several options — skirt steak, or flank steak or minute steak (what in Mexican markets would be labeled carne para asar or carne para bistec) — and they can all be good. Really, your choice boils down to this: choose what you can afford. Now, since you’ll already be at the grill (with a pan of steak marinating simply in lime juice, olive oil and salt), I suggest taking a cue from those fiery Central Mexican street stalls and grilling white onions and nopales (cactus paddles) as garnishes.